So while cooking on my fire pit out in the bush in 2011, I receive an international phone call on my wildlife rescue mobile phone from film director Andrew Graham-Brown (AGB Films) asking me if I would be interested in doing a taster tape about my life with kangaroos. A taster tape is a short film which gives broadcasters a kind of movie trailer to entice them to want to commission a film. I was filmed non-stop for a week. The taster tape was well received by the BBC, and they decided to fund a two-part series. The first sequel in Natural World's history. This lead to the BBC Two series Kangaroo Dundee. I thought it would be a good way of showing people overseas my life living in the outback with my family of kangaroos. I have been a kangaroo mum to orphaned joeys (baby kangaroos) for near on 20 years and it's always been a great passion of mine. In the early years of my kangaroo sanctuary in Alice Springs were roos ‘mad as a cut snake' Roger, beautiful Ella and always curious Abigail. I always knew keeping a hand-reared male roo with a couple of girlfriends would be a problem later on. And Roger’s aggressive behaviour did not surprise me. He grew up with no fear of people and saw them as a threat to his harem. He started kickboxing people at two years old and three feet tall, and continues today at over six feet tall, eight years old and 80-odd kilos. I enjoyed having a TV crew follow me around the bush with my family of kangaroos. I was particularly interested in having them come out on the road with me for my daily patrol of the highway, looking for orphaned kangaroos still alive in the pouch of their road kill mothers. This is a message I have always tried to educate people about. Having a TV crew with me at all times was only really difficult when we were filming Roger the alpha male. The film crew had to be protected behind a wire cage when filming him as he would try to attack them. The cage was built to be transportable and about five feet tall, so a camera and tripod could see over the top. The filming of the new series of Kangaroo Dundee has been a really enjoyable part of my life and the film crew of AGB Films have become close friends. I am really looking forward in the next six-parter to the introduction of orphan roos Rex and Ruby, and Rocky who is a new character and new species in the show, a wallaby. My life has changed with a lot more people telling me I inspired them to be a wildlife carer. This gives me great enjoyment to know that I have changed some people lives, and helped the lives of orphan animals. Kangaroo Dundee is a beautifully filmed documentary and I am proud to be one of the human characters in it and I hope it inspires more people to look after the environment and its animals. Chris 'Brolga' Barns is a conservationist and presents Kangaroo Dundee. 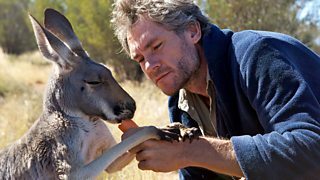 Kangaroo Dundee continues at 8.30pm on Friday, 13 December BBC Two and BBC Two HD. For further programme times please see the episode guide.